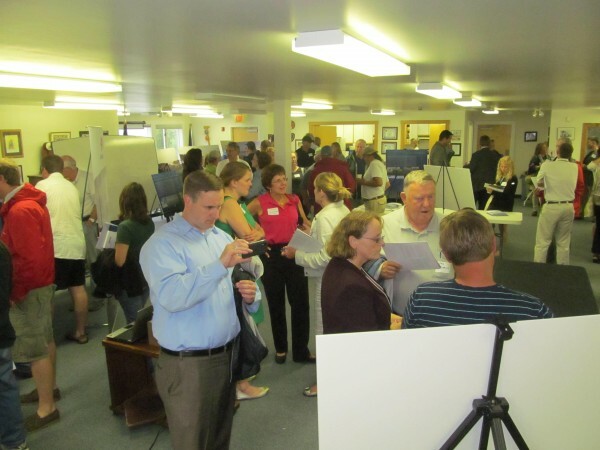 More than 70 people turned out for an informational session in June 2012 hosted by Statoil North America. PORTLAND, Maine — Statoil North America on Wednesday said it was putting its offshore wind energy project on hold because of “the risk and uncertainty” created last week when the Legislature, at Gov. Paul LePage’s behest, made changes that will delay and potentially threaten state approval for the project. The Norwegian company informed the Maine Public Utilities Commission of its decision on Wednesday in a letter. Statoil’s departure would be a big loss for the state from an economic development point of view, according to Annette Bossler, an international business consultant based in Bremen. Bossler, who consults for a German company that is developing a pilot offshore wind energy project in the Baltic Sea, said that in the next two or three years there will be at least a billion dollars invested around the world by offshore wind technology developers. Maine has threatened its ability to receive any part of that investment, Bossler said. “We have a huge opportunity to be part of a global industry, but there needs to be commitment, and I think now that commitment, you can argue, is questionable,” Bossler told the Bangor Daily News. Last week, the Maine Legislature approved LD 1472, which reopens a process by which the Maine Public Utilities Commission approved a plan in late January to subsidize Statoil’s project with ratepayer support. The support allowed the Norwegian company to move ahead with its plan to erect four floating turbines in federal waters off the Maine coast by 2016. The University of Maine, which also is developing offshore wind energy technology, was not prepared to submit a proposal when the PUC first issued a request in 2010. LD 1472 would delay Statoil’s project to allow UMaine to submit its own proposal, and therefore compete with Statoil for that ratepayer support. The Legislature’s actions sent a message, Bossler said: “If you want to build your full-scale pilot to develop this technology further, Maine is not really a reliable location,” she said. And the world is watching. The Legislature’s last-minute legislative changes last week was reported throughout the wind energy industry media, including in Europe, Bossler said. “That is not something only Statoil will notice. Other big players in the industry will notice as well,” she said. Paul Williamson, executive director of the Maine Ocean & Wind Industry Initiative, confirms that Maine is on the world stage, but not in the best light. “I’ve had conversations directly with both small and large players in the international offshore wind industry, and I’ve received reaction from those various parties that if the state of Maine doesn’t follow through with Statoil, they would not think of the state of Maine as a good place to invest in offshore wind energy,” Williamson said Wednesday. Maine is not the only place the company is looking to launch its pilot project. “Statoil is considering several locations for building a pilot park based on the Hywind floating concept, in addition to Maine,” he wrote. Bossler, who in May released a report on the global offshore wind energy industry, said Statoil is looking at a pilot project in Scotland and in November signed an agreement with Hitachi in Japan. UMaine’s project involves placing 170 6-megawatt floating wind turbines in the Gulf of Maine in an effort to generate up to 20 gigawatts of electricity by 2030, which is some 15 years later than Statoil proposes being online. The UMaine project involves the university’s Advanced Structures and Composites Center and Pittsfield-based building contractor Cianbro, among other entiti es. Williamson said the state’s desire to support UMaine’s project “is fantastic,” but it should have gone about it another way. Tom Welch, chairman of the PUC, wasn’t surprised by Statoil’s decision. He acknowledged that LD 1472, which will force the PUC to reopen its review process and consider UMaine’s project for ratepayer support, delays the PUC’s approval of Statoil’s contract and therefore creates uncertainty for the company. There has been some deliberation over whether the PUC could provide ratepayer support to both the Statoil and UMaine projects, but Welch said that isn’t likely, at least if both were the size of Statoil’s project. “You could certainly not support both of them at the level Statoil is now. The ability just isn’t there,” he said.